As with the previous book in this series, The Language of Content Strategy, this book contains definitions of terms that practitioners need to know. The terms are divided into five categories: Core Concepts, Technical Concepts, Standards and Conventions, Deliverable Presentations, and Future Directions. The terms range from accessibility to topic-based authoring to artificial intelligence to wearables, everything from basic terms that will be familiar to most technical communicators to terms that are just coming into view. Each term is authored by an expert in that area, and each expert contributed a definition, a statement of importance, and an essay describing why technical communicators need to know their term. Together, these terms form the basis of a common vocabulary across a wide spectrum of specialties in technical communication. 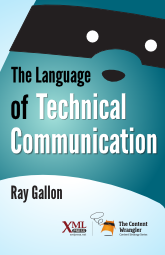 The Language of Technical Communication is available in print and eBook form from all major online book retailers, including Amazon, Barnes and Noble, and O’Reilly Media (eBook bundle). Through June 5, 2016, the eBook bundle at O’Reilly Media is available for 40% off the retail price. Use the discount code summit16 at the O’Reilly Media store or this direct, discount-included link. All XML Press eBooks at O’Reilly Media are eligible for this discount.